When I buy a leg of lamb for a special occasion I remove the bone and butterfly the meat. When I buy a shoulder chop I usually trim off the rib cage bits and save them for soup. Like my frozen bits of chicken, I usually have a couple of lamb bones tucked away in the freezer. These are great soup starters for lamb broth. I do not like the texture of cooked carrots, but I do like the flavor they give to stews. To get the one without the other I usually grate the carrots into fine shreds. These bits cook away and fall apart into a fine sauce that add their flavor without leaving mushy lumps. Scotch broth is not an exciting stew. If you want bright colors, make an Italian soup. If you want spices, make a Moroccan tajine. 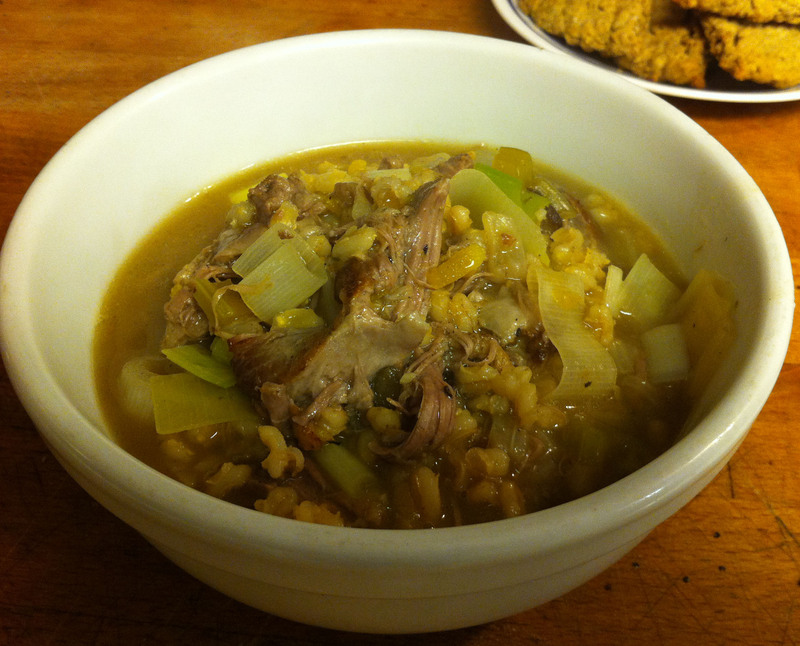 Scotch broth is meant to be sustaining and to keep you warm and well fed in the cold Scottish Highlands. 1. In a soup pot add the bones, the lamb chop, and one tablespoon of butter. Brown the meat on both sides. Tip: There is a debate among Scotch broth aficionados, about whether to brown the meat or simply add it directly into the water so you get a more subtle lamb flavor. I like the strong flavor of browned meat. 2. Add 6 cups of water and bring the pot to a boil. Reduce the heat and simmer for 1½ to 2 hours, until the chop is falling apart when you pick it up. Tip: There will be some foam on the surface of the pot. Use a sieve or spoon to remove this and discard. 3. Remove the meat to a bowl and cool. Strip the meat and break it into small bite sized pieces. Reserve in a bowl until needed. Tip: Discard the bones and any large lumps of fat. 4. If you have time you may continue to simmer the bones for another hour. Strain the broth and reserve it in a bowl. Tip: When you are done simmering you want about three cups of lamb broth in the pot. If you wish you may scrape the marrow out of the bones and add it back to the pot after straining the broth. 5. Let the broth settle for 15 minutes and then ladle most of the lamb fat off the surface into a small cup. Put the cup in the freezer for 30 minutes while you are finishing the soup. Tip: Much of the flavor is in the lamb fat. You do not want to remove all of the fat from the soup, you simply do not want it to be too greasy. Do not be concerned that you are ladling up some of the broth as well as the fat. Congealing the fat in the freezer will allow you to scrape off the fat and add the good broth back to the pot. 6. Without cleaning the pot, sauté the onions for 5 minutes, until just translucent, and then add the carrots, celery and garlic. Sauté for two minutes more. Tip: There will be enough lamb fat clinging to the pot so you will not need to add any other oils to sauté the vegetables. 7. Return the broth to the pot and add the barley, pepper and salt. Bring to a boil, cover, and reduce the heat. Simmer for 30-40 minutes. 8. Cut the leek in half lengthwise and then cut it into half inch slices. 9. Add the leek to the pot and continue cooking for 15-30 more minutes, until the barley is tender. 10. Remove the fat cup from the freezer and scrap out the fat. Return any broth to the pot. Tip: This excess fat may be discarded or you can use it to make oat cakes to go with your Scotch broth. 11. Return to meat to the pot and heat for 5 to warm it. 12. The Scotch broth should be closer to a stew than a soup, but if it is too thick add some water to thin it a bit when you add the meat.